Budweiser's 2014 "Puppy Love" is the platform's most viewed game ad. The Super Bowl is a high-level opportunity for brands to get their products in front of more than 110 million TV viewers. For the past 10 years, YouTube has encouraged its users to also watch and vote for their favorite Super Bowl ads through its AdBlitz profile. Now, the platform is revealing its top 20 Super Bowl ads. On Wednesday in a blog post, YouTube released "AdBlitz’s 10-year Anniversary Report," which analyzes the platform’s Super Bowl ads, ranking them by the number of views they received in the January and February of the year they debuted. The top finding was that most of the best-performing ads—90 percent—were released prior to Super Bowl Sunday. "Advertisers that upload early do better overall," said Tara Walpert Levy, VP of agency and media solutions at YouTube, in the blog post. 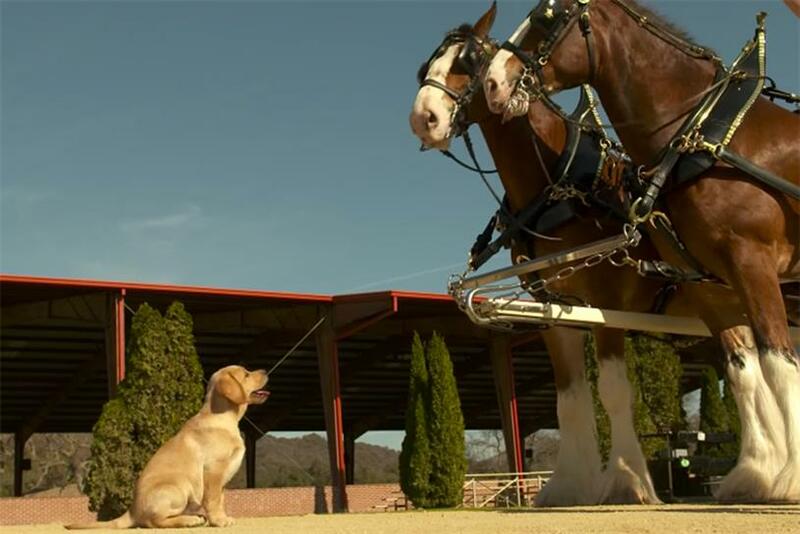 For instance, Budweiser’s "Puppy Love," released in 2014 by Anomaly, in which a puppy starts up a friendship with a Budweiser Clydesdale, is YouTube’s most viewed Super Bowl ad and was released early. Budweiser also takes the fourth spot on the list with its 2015 "Lost Dog" from Anomaly, another ad released before the Super Bowl. 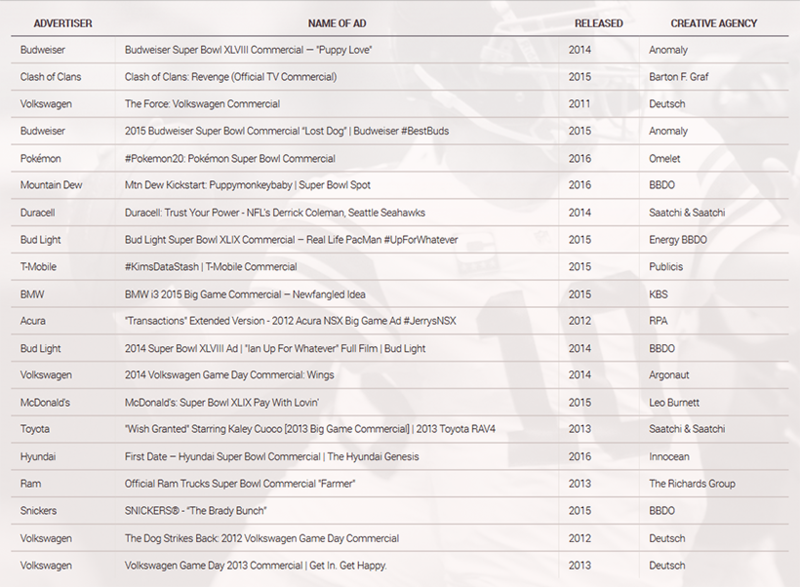 Volkswagen and Deutsch also released their Super Bowl ads early and, overall, are the most represented brand and agency on the list with four spots in the top 20. The brand's 2011 "The Force" spot, in which an unforgettable little boy dressed as Darth Vader believes he is the one powering a car, took third place. The trend of releasing Super Bowl ads before the game is rising. In fact, the number of ads released early has grown by over 200 percent from 2008 to 2016, according to the study. Car and beer brands are regular Super Bowl advertisers, and YouTube’s study reveals that these categories also did well on the platform. Car brands like Volkswagen, BMW, Acura, Toyota, Hyundai and Ram, and beer brands like Budweiser and Bud Light make up 13 of the top 20 ads. Two video game ads ranked within the top 20, commercials for Clash of Clans and Pokemon. Clash of Clans’ "Revenge" 2015 ad starring Liam Neeson, and created by Barton F. Graf, came in second, and Pokemon’s "#Pokemon20" 2016 spot, made by Omelet, came in fifth place. Combined, the ads have driven over 440 million minutes of watch time (equivalent to watching the Super Bowl 1.8 million times), with the month of February accounting for 30 percent of all activity. February also accounted for nearly 30 percent of new channel subscribers for each brand.